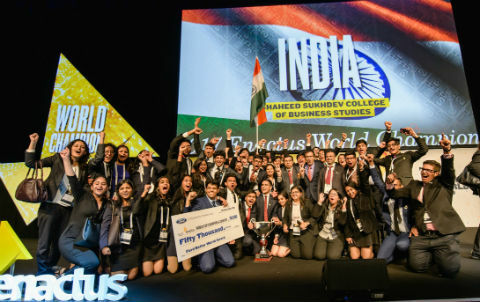 London/New Delhi, September 30, 2017: After a gruelling competition before an eminent panel of business judges from across the world, Team India, represented by students of Shaheed Sukhdev College of Business Studies Delhi, emerged as the deserving winner of the Enactus World Cup 2017. 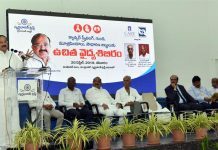 The winning projects included Mission RAAHATand project UDAAN. Aiding Indian Government’s Digital India and Swachh Bharat Abhiyan initiative, mission RAAHAT works toeradicate open defecation and provide safe sanitationin urban slum communitieswhereas project UDAAN aims to bridge the digital divide between urban and rural India by setting up computer centers. Enactus, an international nonprofit organisation with 72,000+ students from 1,700+ universities in 36 countries held its annual, signature global event – Enactus World Cup from September 26th to 28th, 2017. A select group of 3,500 students, business, academic and government leaders from around the world gathered in London for this special event that included three unforgettable days of collaboration, competition and celebration. 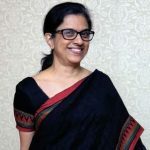 The Shaheed Sukhdev College of Business Studies team was led by Anuja Mathur, Faculty Advisor, SSCBS, Delhi & Additya Sharma – Student President, SSCBS,Delhi, including 34 members participating in the winning projects. As World Champions, the Ford Motor Company Fund presented Enactus SSCBS and Enactus India the Ford Better World Award of $50,000USD. Enactus is a leading international non-profit organization dedicated to nurturing the entrepreneurial skills of students, and to addressing fundamental social and economic challenges by creating experiential learning opportunities for students to use their entrepreneurial skills to transform communities.It provides a platform for teams of outstanding university students to create community development projects that put people’s own ingenuity and talents at the center of improving their livelihoods. Guided by educators and supported by business leaders, students take the kind of entrepreneurial approach that empowers people to be a part of their own success. Enactus transforms both the lives of the people they serve, and in turn, the lives of the students as they develop into more effective, values-driven leaders. Through the delivery of innovative experiential learning in entrepreneurship and social impact, Enactus effectively broadens the students’ business leadership skills and enriches their ability to contribute to the strength of communities worldwide. With operations in more than 36 countries and impact in even more, the Enactus network is powered by a committed network of academic and business leaders who serve as mentors, guides and supporters.